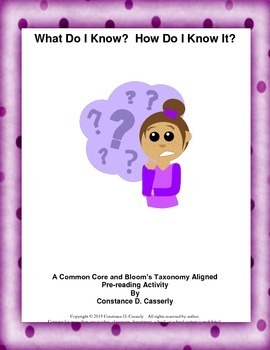 This activity, "What Do I Know? How Do I Know It?" offers two charts for Middle and High School students to complete as a pre-reading activity, and a closure activity. First, they read the front, back and inside covers of the book they will study, as well as the first five pages. Next, they fill out Part 1 of the chart, answering the questions, "What I Know," What I Think I Know," and "What I Want to Know". After that, they divide into groups and fill out the Part 2 chart, "What We Know," "What We Think We know," and "What We Want to Know". For Part 3, they individually complete this Closure activity. When students are finished with that, they discuss the three basic questions and individual Closure points as a class. This chart is a perfect way to introduce any fiction or narrative non-fiction text, be it a short story or novel-length piece. Comprehension Assessment Activity - "Exit Pass"